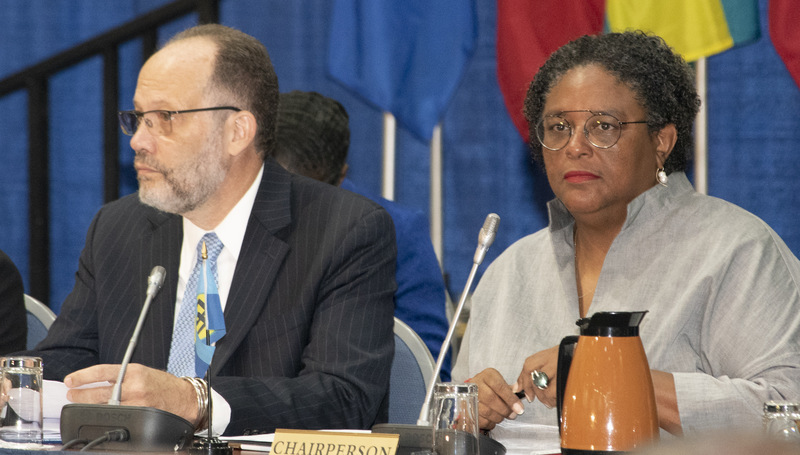 CARICOM Citizens can rest assured that their leaders are moving with “renewed passion and energy” to make sure that the Community is functioning. This was pointed out by Chairman of CARICOM, Prime Minister Andrew Holness of Jamaica and Chairman of the Council on Finance and Planning, Prime Minister Gaston Browne of Antigua, at a briefing to close the Sixth Meeting of the Council on Finance and Planning and The Ninth Special Meeting of The Prime Ministerial Sub-Committee on the CSME on Wednesday, September 5, at Ilaro Court, Barbados. Chairman of the CSME Sub Committee Prime Minister Mia Mottley and CARICOM Secretary General Ambassador Irwin LaRocque were also present. Noting that CARICOM citizens may sometimes question the viability or the purpose of CARICOM, he said they could “rest assured that the CARICOM institutions are working [and] are functioning. To have both the Prime Ministerial Sub-committee and a second meeting of the Council of Finance Ministers in less than three months is a significant achievement seeing that they have not met in a really long time”. “There is, as has been said by Prime Ministers Browne and Mottley, a renewed energy and I dare say, passion for the practical form of integration that will move our entire region and to collaborate on mutual threats and challenges and I believe that that augurs well for everyone,” Prime Minister Holness said. In his remarks, Prime Minister Browne thanked the Prime Minister of Barbados for the energy that she has brought to the CSME, noting that she has been “a tower of strength in the integration movement” and has been playing a significant role in ensuring the functionalities of the organs of the CSME and that there was increased focus on the CSME. He also praised chairman of CARICOM, Prime Minister Holness, for identifying the CSME “as a critical area to ensure that we have a truly functioning Community, and for advocating a move towards the eventual establishment of a Single Economy”. Prime Minister Browne, in giving a synopsis of recommendations by COFAP, said that leaders agreed that having a deposit insurance system for the region would help to establish a level of protection for depositors against losses due to the failure of some financial institutions. 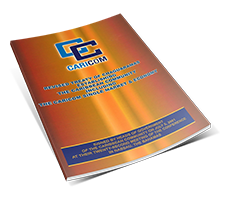 He added that the system was especially important considering the failure of some financial institutions within the region and was required as a matter of urgency to enhance the financial safety-net for depositors and even for investors in the CARICOM Single Market and Economy. “We also took follow up action on the mandate from the CARICOM Heads of Government calling for the finalization of some of the relevant instruments before the Inter-sessional meeting in February of 2019, and others by next July. These include the Community Investment Policy; an investment code; an incentives régime; and an integrated capital market; starting with the adoption of model securities market legislation” he added. Prime Minister Browne signaled that agreement was also reached on expediting the finalization of the CARICOM Financial Services Agreement, and approval given in principle for the objectives of the CARICOM Credit Reporting policy. He explained that the policy would provide for the regulation of the operations of credit bureaux and cross border exchange of credit information within the Community, to promote financial inclusion for CARICOM nationals, as they live and work across the Community. 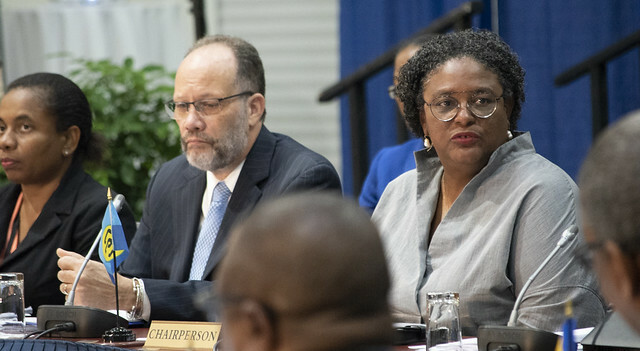 Prime Minister Mottley said the meeting of the Prime Ministerial Sub-Committee on the CSME agreed to send forward a number of recommendations to the Special Meeting of CARICOM Heads of Government on the CSME to be held in Trinidad and Tobago later this year. These would include expansion of the categories of workers who can move and work across the Region on the CARICOM Skills Certificate. “Right now there are 10 categories [of workers] and we have agreed to recommend an eleventh category of agricultural workers, primarily because we recognize the importance of being able to obtain food security across the region, particularly in these difficult and turbulent times. “And…after the realization of what the climate can do and hurricanes can do and now we see earthquakes disrupt the whole production and distribution cycle, and we are conscious and sensitive to the fact that we have to be able to move the region closer to a level of food security in ways that would not perhaps as assiduous about doing in recent times,” the Prime Minister said. CARICOM Secretary-General Ambassador Irwin LaRocque said he expects the concrete recommendations which will go the Special Meeting of CARICOM Heads later this year can be expected to lead to important agreements concretised for implementation.